How well would this TRIPLE STRENGTH Lodestone Mojo hand assist in achieving the desired results of another Triple Strength Mojo hand? Without knowing what Triple Strength mojo hand you are wanting to assist it is a little hard for me to tell, but Lodestones work to draw and attract things to you, so a Triple Strength Mojo hand is going to do that in spades. It is common to wear more than one mojo bag but I have not heard a lot of this idea of using one hand to intensify or assist another hand, your mojo hand, especially a triple strength mojo hand will be powerful in and of itself provided it has been charged and fed correctly and consistently. Is this the equivalent of being an all-purpose Triple Strength Mojo Hand? I mean, can it be used for any purpose? A Triple Strength Lodestone bag is going to be chock-full of goodness, and the primary purpose of the bag will be to attract and draw things to you that you want. I have been reading through the forum and had two questions regarding my mojo hand and another on feeding it. I ordered a triple strength lodestone mojo hand from LM. I have also ordered a three johns jack ball. I have been researching Rootwork for about 7 months now. Magic in general for about two years. However I just started practicing 3 months ago. I have been so excited to discover LM! 2) Next my ordered items as well as my own first mojo hand that I'm working on at home all contain lodestones as I'm particularly interested in their nature. Could the lodestones effect each other? Especially if they were in the same box or pocket? I just don't waYnt them to cancel each other out even though I'm pretty sure this isn't the case I just want to be sure. 1--I have used a Bourbon whisky as well and never had any issues with my lodestone, so you should be fine. However, you mention the word offerings so I do want to take a moment and say, and forgive me if you already know this, but you are going to use the whisky to feed your lodestone-in other words it won't sit on your altar in front of your lodestone in a pretty glass, you will pour it over your lodestone-make sense? 2--I have a hard time seeing how lodestones could cancel each other out--lodestones are considered living entities in Hoodoo-do two living entities cancel each other out? Think of puppies-if you have two puppies do they cancel each other out-no! With that said, I tend to keep my lodestones separate because I have separate altars for my love and money/success cases. When I lived in a tiny apartment I only had one altar for both love and money-actually for all of my "drawing" conditions and I kept lodestones for love as well as my prosperity lodestone on that altar-they did not interfere with one another at all. Wow thanks for the quick response! Second thanks for addressing that I wasnt sure I believe I was thinking in terms of magnetism and how some attract or repel each other so that's good to know thanks again for the advice! Bri, that was the sweetest reply: "If you have two puppies, do they cancel each other out? No!" LOL! Hello! I feel like I Am on every forum! Haha. 1) feeding the lodestones in the mojo bag.... I've heard some say not to open the mojo bag once made... I've also heard someone saying it can be "fed" by opening it.. CONFUSED! which is it? 2) can I use two other lodestones for the SAME purpose on my altar for come to me work? Such as slowly bringing two stones closer and closer? 3) If i do that, is this contradicting to the two lodestones I would have in my mojo bag, since they would both be Me and my lover and same purpose? 1) It is not customary to feed a lodestone once it and its magnetic sand are tied in a bag. Instead, you feed the bag. You may be thinking of how it is fed on an altar. You are making your own mojo kind of "blind." This thread is about our hand-made Lodestone mojo hands -- with come with all ingredients and full instructions. 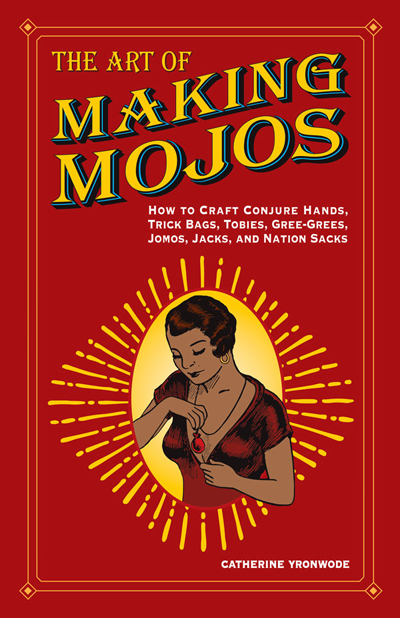 And please do get the "Art of Making Mojos" book i recommended above -- is actually answers both your questions 2 and 3 with a very nice illustration, showing exactly how it is set up and how it's done. So I just put together my triple strength Lodestone Luck hand. After writing my wish and crossing it with my name 9 times using a red pen, I dabbed the 4 corners with the oil then put the Lodestone in with a lock of my hair and folded/turned/folded it a few times. I don't have a specific money/love wish so I didn't do those bits, just placed the items inside. I placed them all over the flame of my Good Luck vigil candle while repeating my wish and other than the Lodestone oil I occasionally also used a small mix I made of Leo (me. Today is my birthday ), Mercury for contacts, Good Luck and Crown of Success oils.. I was going to add a 5 penny coin as that's something I believe is from my dad. I've collected a lot of them everywhere I've been going to since he passed away last year. But it seems I forgot it. Instead I added a small heart charm I was given by a kind stranger I once met in a very emotional yet career-related scenario, and it's been giving me luck since, I carry it everywhere. I thought it'll be fitting in the hand with Lodestone oil. Now...I have it next to me and I feel a strong need to touch it all the time. Is that weird? That's not weird at all! It sounds like you put together a lovely mojo bag. Now just remember to feed it and take care of it, as well as keep it secret. Sorry you had a rough day, aniviel. Take care of yourself. I recently purchased a triple strength lodestone mojo hand, I think maybe last Saturday. It wasn’t but within a few hrs that I noticed it was already awakened. I could tell because the energy from it was VERY strong and intense. I kept it on my person as much as possible for the full week. Yesterday made the official 7 days since I had it, but unfortunately I am a bit disappointed…….. The petition paper I put inside prior to sealing it and activating it was concise and to the point, but it was made general enough to focus on pretty much anything I desire (As long as it is within the focus of the bag’s overall intention, of course). However, I’ve come to notice that it doesn’t do anything I ask. I mean not ONE SINGLE THING! I’ve tried talking to it, feeding it, praying over it, etc. I always make it clear that if it does such and such favor for me I will feed it. Yet, nothing still. The thing is, it is ALIVE. As I said before, I can feel the energy from it, especially it being a triple strength. I know I may be going a bit out of topic with this, but I also have a crown of success hand (which I’ve already mentioned several times over in my other posts around the forum) and while it’s energy is more subtle, being a regular strength and all, I can say for a fact that it DOES work! I’ve definitely seen results. I was expecting a lot more from my 3x lodestone hand though. I really don’t know what to do. EDIT: One thing I forgot to mention......while I was activating the mojo I didn't even think to put any magnetic sand on the lodestone grit, which at the time I didn't even have any on hand but I have since ordered some. Do you think that could be a possibility as to why it's not working? I read somewhere on this forum that you are not supposed to open a mojo bag once it has been sealed, so IF that happens to be the reason then I am pretty much screwed, I guess? You may want to wait a bit longer before being disapointed as its only been a week. work takes some time, effort and energy. Also Hands are not wish granters, we dont generally ask a hand to do something then another thing etc. IT gives you the edge in those things you seek. You also can use a bag for general things but it tends to be better suited when its directed at one specific task. 3X lodestone comes with 3 times more items used in making the bag. The bag comes with magnetic sand already placed in the bag to feed the lodestone, it was created to be a ready to go mojo, after you personalize and seal it. I would keep wearing it, praying over it, speaking to it. I would Have a positive attitude and believe that it will happen for you. You can continue to dress it and make it strong, say as I feed you with this oil feed me with my prayer request of..... Burn candles relating to the work dressed with the same oil. Thanks JayDee. That gave me a bit of hope and explained some things too! I just didn't know if maybe there was something I did wrong or maybe the mojo just wasn't working for whatever reason. I will definitely give it more time and continue to develop the relationship with me meanwhile. My tasks for it are ongoing general attraction purposes and not just a one time hit, so I hope that it will be there for me when I need it to. I understand and mojos can be made for general good luck, but that does not mean each time you want it, it will "hit" for you. Seems you made a general bring me luck in these areas of my life. If a specific area is needed, I would spend time with the mojo speaking in words what you need and why, light a candle with that need, use the same petition but add this specific item to it this time, carve the candle, dress it and continue on. Remember sometimes its not meant to be but still working. I made a job mojo a while back.. I really really wanted a new job, I got an interview, didnt get the position but the feedback was I was one of the best internals they interviewed, they want to work with me because they do not want to lose me to another company and how much an asset I am. I went up against people with more education, more experience and others in those positions. That was the feedback. A few weeks later im struggeling in post grad classes and doing my job and realized I could never have taken that position and did my schooling which is also important to me. Sometimes we have to listen to Gods time, the mojo is working, its just not right for me. I keep it pray over it and dress it: when the time is right God let this opportunity come to me, then I dress my mojo and still look, yet keep up my good work. I hope this helps shed some light on things for you.